Thin wall impact sockets from Apex Fastener Tools accommodate countersunk or limited clearance nut or bolt locations. 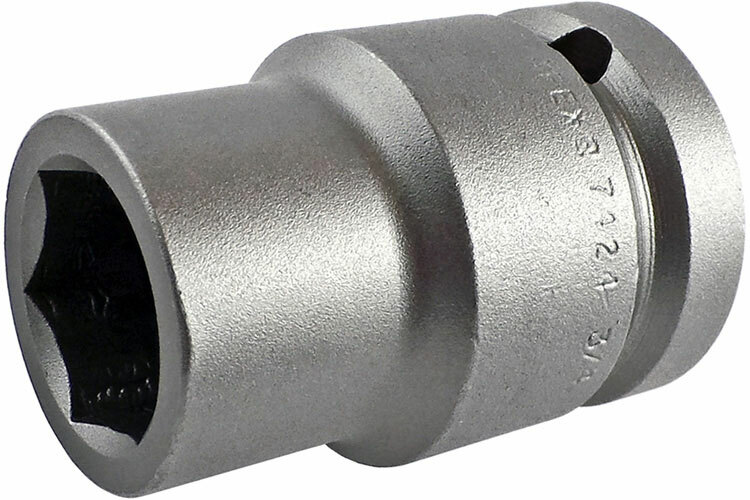 Many of these impact sockets have a shouldered body design that can fit in tight quarters. Impact sockets from Apex Fastener Tools, formally Cooper Tools, have hex tolerances that are on average 48% tighter than DIN and 35% tighter than ANSI requirements. Apex impact sockets provide an exact, sure fit every time. Impact sockets from Apex Fastener Tools provide the tightest tolerances for straightness and concentricity available. The 7426 Apex 13/16'' Thin Wall Standard Socket, 3/4'' Square Drive is one of thousands of quality tooling products available from MRO Tools. Please browse Apex 3/4'' Square Drive Sockets, SAE, Thin Wall, Standard Length for tools similar to the 7426 Apex 13/16'' Thin Wall Standard Socket, 3/4'' Square Drive. 7426 Apex 13/16'' Thin Wall Standard Socket, 3/4'' Square Drive description summary: Apex 13/16'' thin wall standard socket, 3/4'' square drive. Hex Opening: 13/16'' Overall Length: 2'' Diameter Nose End: 1 1/4'' Diameter Drive End: 1 3/8'' Opening Depth: 17/32'' Quantity discounts may be available for the 7426 Apex 13/16'' Thin Wall Standard Socket, 3/4'' Square Drive. Please contact MRO Tools for details.